Beneath the Stains of Time: "There is nothing as deceptive as an obvious fact"
"There is nothing as deceptive as an obvious fact"
"Sometimes the most illogical answer turns out to be the correct one. Reality is often stranger than anything we can imagine ourselves, but I'm not the first one who has said that. It probably was Sherlock Holmes, who always had something clever to say." The book I alluded to in my previous post, read on a sultry and lazy afternoon in the cool shades beneath the trees, was Een mes in de rug (A Knife in the Back, 2012), published under the names De Waal & Baantjer, but the series has been a solo-project of Simon de Waal ever since Appie Baantjer passed away in late August, 2010. It's the sixth installment of a series that began after Baantjer retired the successful DeKok-series that ran for nearly five decades, sold millions of copies and spawned a television series that kept millions of viewers glued to their televisions. A decision as unpopular as Conan Doyle's resolution to wash himself from Sherlock Holmes in the churning waters of Reichenbach Falls, but it was also an understandable one coming from a writer in his eighties, penning two or more books a year, who had just lost his wife – and I thought that with the publication of Dood in gebed (Death in Prayer, 2008) we had reached the end of an era. But the writing bug reared its ugly head and the itch began, and before long, he was working on a new series with his ex-police colleague and fellow crime-writer Simon de Waal as a writing buddy. 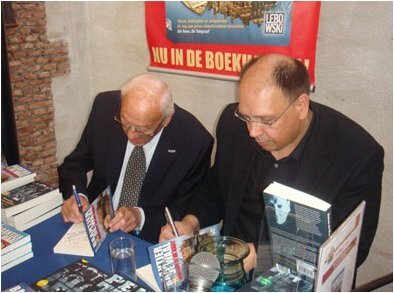 The main characters are the old-school veteran Peter van Opperdoes and his younger partner Jacob, who are basically thinly disguised versions of themselves. You can find traces of them all over the characters. Peter van Opperdoes has also lost his wife, but in the books he still talks with her and the first part makes it clear that he's not imagining things, however, she's only there to speak words of encouragement to her husband and not to whisper the name of the murderer into his ear. It's very unusual to have such a non-intrusive, supernatural entity hovering in the background of a straight-up police procedural. Anyway, Simon de Waal worked as a rookie-cop with Baantjer and this joint-project must have seemed like things coming full circle for them. Writing the first few books must have been fun as Baantjer loved to leave impossible plot-twists for De Waal to sort out. But she didn't have a sister indeed. Good luck with that, Simon! 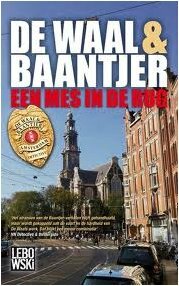 De Waal described Baantjer as someone with the mindset of a charming young man and acted as such, which makes me think of Baantjer as Archie Goodwin in his eighties. So I settled down with A Knife in the Back (yes, yes) and expected nothing more than a charming, uncomplicated roman policier because the first three books were kind of disappointing – with a last-minute introduction of a culprit and a lack of fair play. They were as fun to read as the DeKok novels, but, plot-wise, insufficient to satisfy this spoiled brat. But A Knife in the Back was a marked improvement on its predecessors. The problems for Van Opperdoes and Jacob begin when they have to go to a hotel where a guest has failed to emerge from his room, but the foul smell of murder does not stink up the place despite the presence of a body and the medical examiner seems to agree. Cause of death: heart failure. However, the manager made sure that the detectives did not leave the building without a problem and notified them that the body and the man who had rented the room were not one and the same person. With suspicion on his mind, Van Opperdoes goes over the body again and finds evidence suggesting murder – albeit an accidental one. The old detective showed that an old fox may lose his hair but not his cunning and prevented a murder from being filed away as a natural death. The rest of the plot unfolds through follow-ups on witness testimonies, credit card information and everything else that comes to the surface over the course of a police investigation, but in the end this was more a story about detectives than a proper detective story. Not a bad one, but still not a genuine detective story. Still, that should take nothing away from the book for the average reader because it’s not that kind of story and this will only bother individuals hooked on GAD. De Waal is a fictioneer who dabbles in variety of styles (police procedurals, thrillers and historical mysteries), but has yet to write a classically styled mystery (the historical ones echoed Doyle and his contemporaries) filled with locked rooms, clues and baffling crimes! I know it's an unreasonable expectation, but it would be awesome if one of our top-tier crime writers would pen an old-fashioned whodunit. Because we have to reduce the monoculture of modern thrillers dominating the shelves of our bookstores before it kills millions of people to keep the genre fresh, inventive and more importantly it would make me happy. The next post will be a return to our beloved Golden Age.